Home Apple News & Review The iTunes break up: What will happen to our favorite features? Anybody can make a playlist of music, but iTunes one-ups that with its offering of Smart Playlists. If you’re not familiar with the feature, it lets you create playlists based on certain criteria: everything from the artist name to the number of stars it has to the beats per minute. Not only does it save you the time of manually assigning songs one-by-one, but it also provides you with playlists that update dynamically over time as you add more songs to your library that meet the criteria you’ve set up. 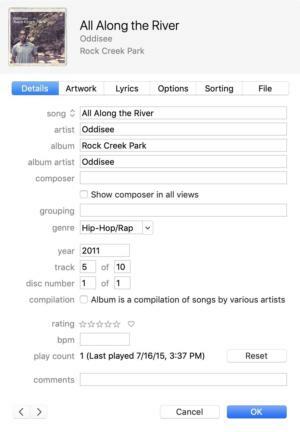 Setting up a Smart Playlist in iTunes 12. Speaking of smarter playlists, another feature that’s fallen by the wayside in the iOS Music app is Genius. First introduced back in 2008, Genius was a system that analyzed your music to automatically build playlists of complimentary songs. Just select a song, right-click to choose Genius Suggestions, and then either pick a song from the list, start listening, or save the result to a playlist. Genius used to be a feature on iOS, but it’s been MIA since iOS 10. Again, while Apple Music’s own playlists and stations have, to a degree, supplanted Genius, that doesn’t help those who aren’t Apple Music customers, nor those who simply want a playlist of music from their own library. I have a sneaking suspicion that Genius probably won’t live to fight another day in whatever replaces iTunes, but I can surely hope. The idea of managing files often seems archaic when it comes to media. After all, what you mostly want to do with your media is play it, and Apple already has a long history of trying to abstract you away from dealing with the nitty gritty of file management. But for all of that, iTunes is actually a pretty solid piece of media management software, and almost all of those features are missing from its iOS counterpart—which isn’t surprising, given that iOS itself has only recently started embracing the concept of a file. The ability to edit the metadata of your media is a key iTunes feature. That said, even if Apple does add new standalone media apps in the next version of macOS, it’s unlikely that iTunes is going anywhere immediately. There are too many features that Apple simply doesn’t want to have to recreate—like, say, all of the iOS syncing capabilities. So while iTunes will likely take a backseat to newer apps, it hasn’t yet been tossed from the car—maybe it will last until some of these more complex features find their way to its replacements.